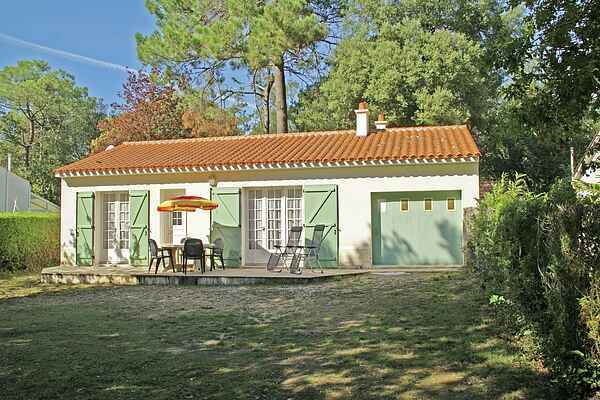 This holiday home is situated in a quiet neighborhood lush with greenery and the tall pine trees characteristic of the Vendée. The charming location bordering the forest helps create a private atmosphere. At the front as well as the back, you have a spacious, enclosed lawn with both large shady trees and sunny spots. A wonderful place to start a new book or enjoy the sun. The electric barbecue on the terrace allows you to end your day with culinary delights! The apartment interior is neat and well maintained. Don't forget to explore the surrounding areas! From your apartment you can walk to a pebble beach (600 m) between the large rocks or along the water to the larger beaches (3 km) away. Here you would be best to leave your car behind for the day as groceries can easily be done by foot in Jard-sur-Mer at a distance of just 1.5 km. You can also find several restaurants, a tennis court, mini-golf and a market (with fresh fish!) here. And if you do take the car, then why not spoil the kids with a day at the water theme park of l'Aiguillon-sur-Mer (27 km)!